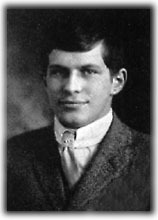 illiam James Sidis (April 1, 1898–July 17, 1944) was a talented mathematician and child prodigy in the United States of America in the early 20th century. He was famous at first for his precociousness, and later for his eccentricity and withdrawal from both the public eye and mathematics. He avoided mathematics entirely in later life, producing works on other subjects under pseudonyms, and today is largely unknown. Sidis’s parents believed in nurturing a precocious and fearless love of knowledge, as opposed to disciplinary punishment, an unusual idea in the early 20th century, for which they received much criticism. For the price Sidis had to pay for being a supreme intellect was that he was incapable of friendship, love, fatherhood, and many other desirable things. As a man he was a failure; as a monster he was superb…. idis could read at 18 months (hyperlexia), taught himself Latin at 2, Greek at 3, had written a treatise on anatomy at 4, wrote four books and knew eight languages (English, Latin, Greek, Russian, Hebrew, French, German and Vendergood, his own invention) by age 8. At age 11, he entered Harvard University as part of a program to enroll gifted students early (the university had previously refused to let him apply at age eight), and gave a lecture on four dimensional bodies to an auditorium of mathematicians which was well-received. After this lecture, MIT professor Daniel Comstock was quoted as saying that Sidis would become the foremost mathematician of the 20th century. His IQ was estimated at between 250 and 300 by psychometrician Abraham Sterling. He was the youngest and most prominent of the remarkable group of prodigies who studied at Harvard in 1909, which included Norbert Wiener, the father of cybernetics, Richard Buckminster Fuller and composer Roger Sessions. n intelligence quotient or IQ is a score derived from a set of standardized tests developed to measure a person’s cognitive abilities (“intelligence”) in relation to their age group. An IQ test does not measure intelligence the way a ruler measures height (absolutely), but rather the way a race measures speed (relatively). For people living in the prevailing conditions of the developed world, IQ is highly heritable, and by adulthood the influence of family environment on IQ is undetectable. IQ test scores are correlated with measures of brain structure and function, as well as performance on simple tasks that anyone can complete within a few seconds. IQ is correlated with academic success; it can also predict important life outcomes such as job performance, socioeconomic advancement, and “social pathologies”. Recent work has demonstrated links between IQ and health, longevity, and functional literacy. normal intelligence quotient (IQ) ranges from 85 to 115 (According to the Stanford-Binet scale). Only approximately 1% of the people in the world have an IQ of 135 or over. In 1926, psychologist Dr. Catherine Morris Cox – who had been assisted by Dr. Lewis M. Terman, Dr. Florence L. Goodenaugh, and Dr. Kate Gordon – published a study “of the most eminent men and women” who had lived between 1450 and 1850 to estimate what their IQs might have been. The resultant IQs were based largely on the degree sof brightness and intelligence each subject showed before attaining the age of 17. Taken from a revised and completed version of this study, the table below shows the projected IQs of some of the best scorers. From: V. Buj, Personal & Individual Differences., Vol. 2, p. 168 – 169. At this point of evolution reached by humanity, we now have many super humans among us today. Over time you have been called by many names such as Avatar, Brahman, Buddha, Christ, Krishna, Lama, Messiah, Savior and many other names less well known. You are a special manifestation who has received supra mental power to carry the overall responsibility for the advancement and well-being of this planet. You have always been among us in times of chaos and great need, wanting to be used as an instrument of peace. Filled with doxa, you can spread ideas of hope and teachings of true compassion into many at once, even into humanity at large. In this way you can cover the earth with transformation through the truth from your superior knowledge of the various fields of science, arts and humanities. According to current and dire statistics, many of those in spiritual and civil positions of power today have truly lost their feeling for the human family. Companies continue to strip mine the earth of gifted humans and material resources with total disregard and disdain for the well-being of the earth and humanity in general. End the struggle within your magnificent mind. It is time for you to come out from behind the veil and begin to exercise your influence as an advocate of humanity. You need to complete your work by teaching that it is not enough to just stay a selfish individual but rather to teach by instruction and demonstration.This is the lesson that will be carried forward by all who are inspired by your much needed contribution. Communicate with the world now and live as a trusting example for us. You will be greeted with love and great concern for your welfare. ever be anyone who can outshine him one day? i don’t know but when da vinci and einstein are beaten so convincingly (look at the difference between his and einsteins score! ), one can’t be too optimistic about such prospect. Well Parvez, I never wanted to talk about it, but now you mentioned if there was anybody who could outshine him, my I.Q. is 301…..
hmmm…301! so you’re the most intelligent person ever to grace the earth!! ever known what my iq is?! i already know you didnt have a clue..
men, what do you know all then? Gertie and Parvez : the intelligent man is one who has successfully fulfilled many accomplishments, and is yet willing to learn more. So you see, I.Q. does not matter, or does it??? well, mr. marcel. i somewhat agree with your view. your very article has shown if having a very high i.q is always good or not. see james sidis…he was and exceptionally intellectually gifted person with an enviable (and perhaps unreachable) i.q of 300! specially, during his early yeas, he showed an extraordinary flare for learning new things in so short a time! amazing! but was he able to keep this momentum going later on in his life? did his very very high i.q help him to keep contributing in the field of maths and in general, keep him accomplishing more? what we see, he suddenly withdrew himself from public eye and society as a whole. he totally stopped contributing to mathematics in which he was very good at. what a waste of intelligence! he didn’t have friends, he didn’t have a family…it is said, he was incapable of love. what a devestated man he emotionally was!! so what was really wrong in such a kind and smart looking person? well, you know mr. marcel, intelligent quotient (i.q) determines ones intellectual capability whereas emotional quotient (e.q) measures ones psychological/emotional capabilites. a healthy balance of both brings success and happiness in our lives. it is clear james sidis was blessed with very high cognitive intelligence (i.q), yet he was painfully deprived of emotional intelligence (e.q). his iq gave him an astronomical intellect while due to his low eq, he had always been emotionally bankrupt. this sheer imbalance and continuous conflict between emotion and intellect didn’t allow him to pursue and cultivate relationship and knowledge later on in his life. he became withdrawn and resigned. he remained lonely and loveless. what a tormented soul!! and it was NOT his fault. nature blessed him with one and deprived him of another. he was a victim of his own exorbitant intelligence…he was a victim of nature’s cruel random experiment!! oh and the person who said their IQ was 301… shut up :guns_tb: POW!POW! Mr. Sidis dropped out of society for the greater part of his life simply because he had no solutions to offer mankind. He was basically a book worm, possessing intellectual prowess but, at the same time, lacking the visionary agility to conceive of a world made beautiful by interlocking all its wondrous complexities into a symphony of mind and nature. Sidis came and went, now almost forgotten. For he was only the seedling – whereas I am the fruited tree. With a mind like my own, all answers to the world’s uneasy quest to find Utopia have been conceptualized by me. Simply read my novel, “Hold Back This Day” (on Amazon.com) and you will begin to see what Sidis was not: a human intellect beyond mortall comprehension, rising from the chaotic flux of this world, and known by the name you will all one day murmur reverently upon your breaths. I am he – Ward Kendall. Seek not further. William James open letter was written by Orflin G. Champion who has always been a curious wanderer able to integrate intuition and analysis into a basis of truth that leads by logical necessity to the threshold of rational wisdom beyond speculative knowledge. Orflin often references William James Sidis in an effort to prepare individuals for the possible scenario of a unified self able to interface with the collective consciousness of all life. In summary, Orflin’s works, written in the spirit of WJS, are a creation and evolution of a beacon of light for any individual open to living their life in an existence imbued with meaning and compassion rather than self-interest and fear. Hey im a Freshman in college and just started tapping into some deep intellectual concepts such as chaos to union, time, and the effects of life on matter, all way over my head. I may not know much about them but i do know that just leaving it at that is not the answer. Can anyone point me in the right direction on how to go about learning more on this intellectual level? There is also no reason to believe that the alien mind letter is authentic. Sidis had a distinctive style of writing from youth to his last writings, and the alien letter does not even come close to mirroring Sidis’ writing style and mental patterns. Other evidence points to Sidis’ unfamiliarity with the topics within the alien mind letter. The alien mind letter is an obvious fake. I disagree with several of the comments on IQ and intelligence, but I have already been enough of a pest. 🙂 I just wanted to jump in and let readers know that much of the online information about Sidis is not fully correct. to die at 44 from a brain bleed sounds to me that he was stressed and flooded with info.He also sounds like he was terribly lonely and in a lot of emotional pain it may be too he was shy about his fame .He may have been to sensitive for the world and saw the extreme in others was not enough to undo the void he felt in himself.In other words he felt he could only do what he was cable of not what others expected of him.Emotionally that is…….. I personally think this is a load of crap. There isn’t even an IQ test that measures that intelligence. It would be hard. I honestly think they have it wrong. I’d say he is 240 to 250 at best, yet even that carries heartfelt wonder? how bout my IQ level ? Sidis seems more myth than fact, the supposed 250-300 IQ is based on pure hearsays, based on ASSERTIONS of his sister mainly….with no really documented IQ test. In fact, AFAIK, the only documented stuff was some kind of test he took to get a job, and he was on position 254 ….would that be credible if he supposedly have 250-300 IQ? Why such myth keeps being promoted as truth? If Sidris would have entered Harvard where the “average” student would be 18 that would be 18/8 or 2.25 or the standard IQ ratio of 225. This assumes the 18 year old is of average intelligence but in fact, let’s assume the standard for Harvard is 120. The baseline is of course is 100 so the person entering Harvard then has an IQ of about 20% above the “average person. You then take 225 multiple that but 1.2 which would give you a very rough IQ of 270 so it is plausible by my rough estimation but these are very rough estimates. However, it does seem consistant. The iq of 250-300 is his childhood-iq, which tends to be somewhat higher. He thought himself to read, as well as knew 8 languages by the age 6. How rare is that? I am 23 and medical student, and far from smart enough to learn 8 different languages by myself, fluently, within a couple of years, as well as learning other things. Indeed, his contribution to mankind has not been that great, but what do you expect of a person without any friends, towring expectations from the whole world, etc. at the age of 11?